Yes, I know this is a bit late. It’s nearly a month since I left India, and how time has flown. So sorry. I’ll try to keep up more. It’s only because China blocked my blog. Honest. Well. What can I say about India. The India tourism people use the tagline Incredible India. Do I agree? Hell YES. I had the most amazing month there. When I first got to India everyone said a month wasn’t very long to spend there. But at that time it seemed a really, really long time to me. Well, now I know what they meant. It isn’t a long time. It’s a very short time. I didn’t really touch the surface, let alone scratch it. You could spend years exploring India. I guess it depends what you want to do there. I spent a month doing a mixture of seeing different sights, meeting different people and experiencing a whole range of different things. I think you’d class it as slow travel, as I only actually stayed in 4 different places. But, I didn’t want to be dashing from one place to another. I found I liked to stay in a place for a while to experience it; get a feel for it. So, it’s safe to say I really enjoyed my time in India. There was something about the place that captured my heart and soul. It was a truly fascinating experience, and now, looking back, it seemed to go so quick. I had a huge range of experiences; done things that I never would have dreamt I would do, and experienced things I never would have if I had stayed in the UK and carried on my life as I was. I’ve seen and learnt so much, if I was to try and write down everything I wouldn’t know where to start. So, I’ll make an attempt to do a bit of an India roundup on some of the highlights and ‘special’ moments. There were lots, and I’ve probably forgotten some that will probably come back to me when I hear, see or smell something years from now. Seeing the Taj Mahal. It’s probably the most beautiful building I have ever seen. I will never forget that first glimpse of it through the gatehouse building, it was like it wasn’t real. I’d seen so many pictures but to see it in real life was just something else. Spending ten days in silence. Thinking back, I’m not quite sure how I managed this. But I did, and I will always remember the thought of it being harder than the actual doing of it. But it was one of the best 10 days of my life. I learnt so much, I got a glimpse of what goes on inside my head and took a break from life for a short while to just stop and look around for a bit. Learning about Buddhism. I knew nothing about this religion before coming to India. Surprising really, as it’s probaby the only religion that is close to how I want to live my life, and some of my core values and morals. So to spend time learning about it was fascinating, and made me realise I’d not done any learning for a while. It was good to get my brain in gear for a bit. The food. Oh, the food. Curry for breakfast, lunch and dinner if I wanted. It was goooood. I got to try all sorts of stuff; proper home cooked Indian food, hot curry in Delhi, traditional tibetan momos cooked all ways, porridge with banana and honey, paneer in everything, meals on wheels on the train and more types of Indian bread than you could shake a stick at. Throughout my whole month, there wasn’t even one thing that I tried that I didn’t like. And I never got Delhi belly. Win. Staying with a local family. I got to experience real Indian life. Real Indian food, TV, conversation, toilets, showers. I learnt about their religion and beliefs, traditional family life and how to make a mean dahl. 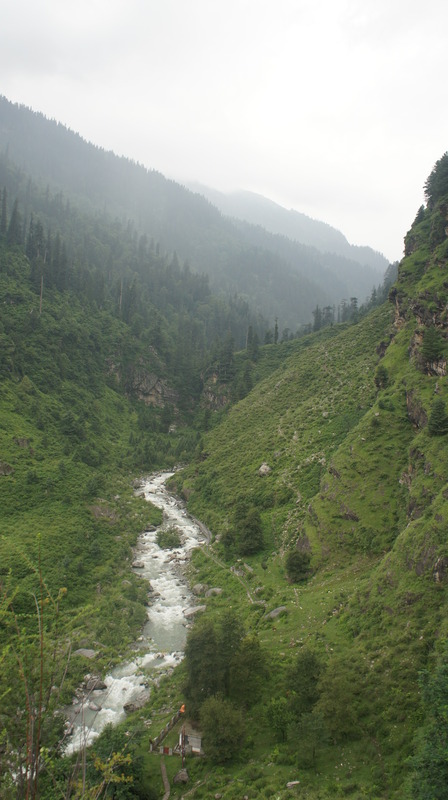 Hiking in the foothills of the Himalayas. The mountains in the places I visited (apart from Delhi) were all himalayan ranges, and I made efforts to go walking and hiking as much as I could. 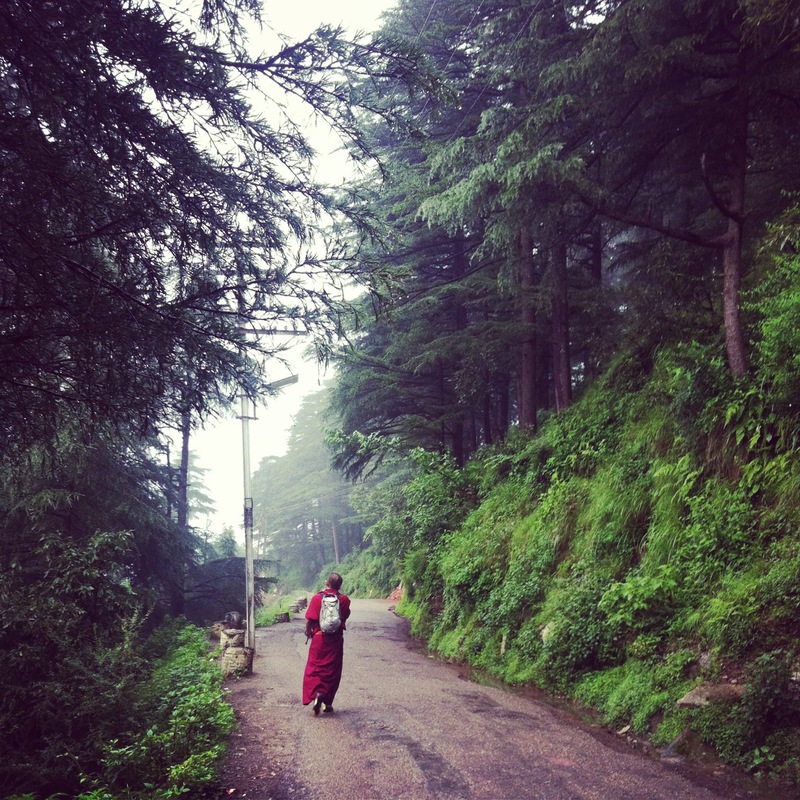 My best memory was the walk Vicki, Anne and I took in Mcleodganj. Not only did I meet two amazing, interesting people who I hope I will see again someday, but we got to see a beautiful waterfall after a little steep walk up a mountain. I couldn’t think of a better way to spend a day, although the monsoon rain we got caught in just before we reached Dharamkot could have done one. Heat and humidity. Ok, yes, I know part of the reason I came travelling is for a bit of sunshine. But, not 35+ degree heat. And not humidity. I didn’t realise how humid it would be in Delhi, and I really didn’t like it. Thank god for air conditioning! It’s making me appreciate the weather in England. Those few days in the summer that are a bit hot and stuffy, they’re nothing like here. I’ll certainly think before moaning in future. Monsoon rain. Yep, I visited India in the monsoon season. I had to; it’s the only time it fitted in with the rest of my plans. But, it wasn’t so bad. It’s not like it rained non-stop – it was only ever a couple of hours at a time. And it was quite pretty when I was at the retreat centre as I wasn’t going anywhere anyway. And with monsoon season comes some amazing thunderstorms and so much lightening. Like a free firework display, love it. Getting caught in it after the hike to the waterfall wasn’t cool though, we got absolutely drenched. Like drowned rats. Hats off to my Berghaus jacket though – I was dry on my top half underneath, which, considering the rest of me, was a small victory. Being stared at. This is not normal for me and I found it very strange. Sometimes it got a bit wearing. Sometimes I felt like I had two heads. Sometimes I had to check I a) hadn’t got something on my face or b) wasn’t exposing myself unintentionally. People wanting their picture taken with me. This happened A LOT at the Taj Mahal. Sometimes people would just sit down on the bench next to me and start snapping away. Mostly they would ask though. Some people wanted pictures shaking hands, some just stood or sat next to me. Or they’d shove their children towards me. I felt like a celebrity, but I am still bewildered about why they would want their picture with me. A red-faced sweaty tourist? I ended up sitting next to one guy who had his picture took with me on the train on the way back from the Taj Mahal, and we chatted for a couple of hours. I asked him why, his english wasn’t great but he said something along the lines of that they don’t see a lot of Westerners, and of those that were there, I was beautiful, and so worthy of a picture. Not sure if this is actually true or whether he was just trying to be sweet. Either way, I’m still not sure I get it. Scammers. All the scammers. Oh, there’s loads. Especially in Delhi. You have to constantly be on your guard, and think about people’s motivations, and remember that to a lot of people you are just a walking wallet. This is a shame really, but it’s just the way it is here. Luckily I didn’t get scammed; I had read up beforehand and generally have a feel for what’s right and what’s a bit dodgy. Missing my onward flight to China. Yeah. This was a bummer. I’d underspent in India, which was great I thought, more money to go towards China where I’d booked a tour and so overspent already. But no, that underspend (and more) went on booking a new ticket to China because I managed to read my ticket wrong. I’ll not make that mistake again. Hopefully. Toilets. Hmm lots of different toilet experiences. No Delhi belly, not that kind of experience. Ok, so 1) squat toilets, some good, some bad. Tip: don’t go to a squat toilet in bare feet while drunk. Yep, I pissed on my feet. And god knows what I might have stood in. I blame the Kingfisher Strong beer that night. Good job for taps in toilets in India. And always carry toilet paper with you. Handy for all sorts. 2) I stood in a cow pat in my flip flops once. Tip: always look at what’s on the ground in front of you; those cows get everywhere. 3) Once I had to make an emergency toilet stop in the woods half way through a run. Large Asian plant leaves make good toilet paper. Luckily it wasn’t a poisonous one. 4) When somewhere says don’t put toilet paper down the toilet, you really shouldn’t. Not me, but someone at the retreat did. It blocks the toilet. Not pleasant. Having some downtime in Manali. I spent a week not doing a lot. In a way I felt I should be, but in another way it was nice to have a bit of a break. I needed it. I read a lot, went on walks, ran, ate and slept. I’ve not done that for ages, and after all the hectic planning of the last few months, the teaching in Zambia I needed a bit of downtime. Like a holiday. Ok, I know I’m technically ‘on holiday’ but travelling isn’t quite a holiday. Certainly not in India. It’s busy, can be stressful, you have to figure out where to be and when and how and everything is new. Constantly looking at maps and trying to find out how to do stuff. The scenery. It’s just been amazing. Mountains, forests, rivers and lots of trees. I do like a good landscape, a mountain here and there and green stuff. I grew up in the countryside so although I love cities, I think I love natural stuff more. And India has had loads of it. Ok, so some of it gets ruined by the amount of litter or electric cables or water pipes but that’s just what it’s like here. Meeting all kinds of different people. I’ve met loads of people. All sorts, from all different backgrounds, all doing different things and on different journeys. Everyone has a story to tell, and some people I’ve met so far have just fascinating ones. I’ve made some new friends, I’ve shared meals and drinks with people that I’ll never see again and don’t even know their name. I’m amazed by the kindness of people, and grateful for the help I’ve been given, and pleased I’ve had a chance to help people myself. The traveller community is a diverse, multi cultural melting pot and now I’m part of it. Travelling in different ways. I’ve been on trains in sleeper class and chair class, local buses, private buses, mini buses, my feet, rick shaws and more. All while carrying around everything I have in just a backpack. Which is still heavy. I’m getting used to chucking it on and off though, and am a dab hand at getting in a rickshaw without taking it off (there’s a bit of skillful negotiation needed to get the bag and my body through the gap between the roof, the curtain and the chassis). The buses are just scary but fun, the roads are crowded and busy, the trains are efficient and serve good food and my feet still keep on taking me places. Like I said, I’m sure there’s loads more but that’s off the top of my head. India was incredible, and I’m pretty sure I’ll be back someday. It’s a huge country and there’s so much more to see and explore. And it’s so cheap. Where else can you get a bed for the night for £1.25? Or a meal out for £2.00? I’m getting used to travelling without having anything booked or arranged. This isn’t normal for me; usually when I only have a couple of days or weeks I want to make the most of it and so usually have most things booked and planned, but I’ve quite enjoyed the freedom of no real plans and just seeing what will happen. I’ve enjoyed spending time in a place and just experiencing it for a bit, not going from sight to sight. I suspect other places in India have more of this, but where I went that wasn’t the case, it was all about the experiences. And experience it I did. My first run in China. 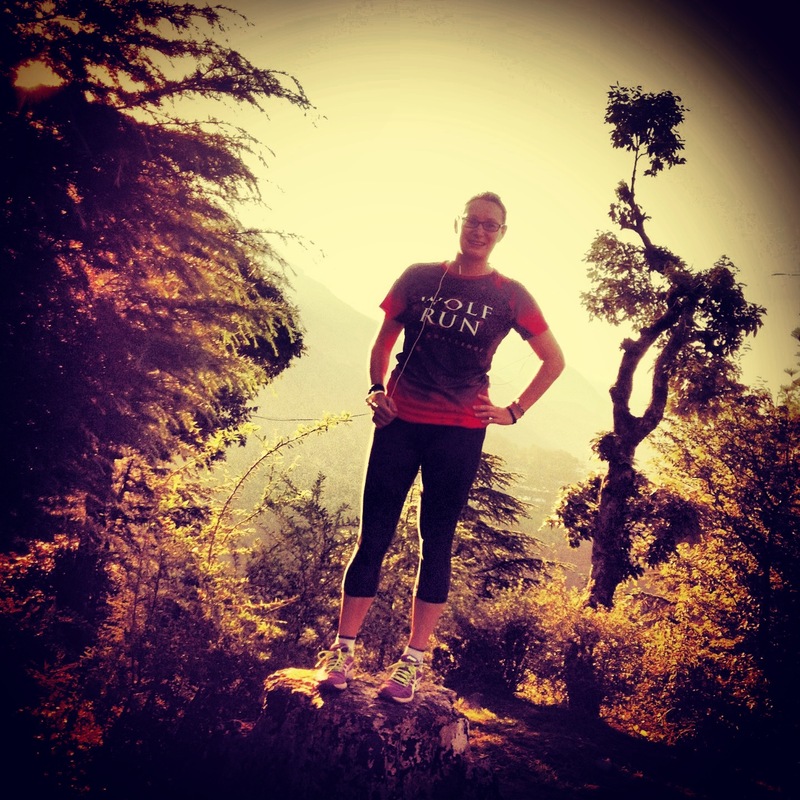 It’s been nearly a week since my last run in India and my legs were getting twitchy. I start to get a little bit grumpy if I don’t get to run, or at least do some kind of exercise. So I don’t like going that long between runs but I didn’t really have a choice. So, I was itching to get out there and get the legs moving. First things first. I’m in Beijing, capital city of China. Probably the most polluted city in the world (I haven’t checked that for exact facts but I know it’s pretty high up there). I’ve been here for a few days, and have been checking out places to run and the conditions. The first day I was here the sun was hidden behind this thick layer of what looked like cloud but what I actually knew to be smog. There was a haze to everything, like those summer days back in England, only this wasn’t an innocent sunny haze. I wasn’t quite sure at this point whether I wanted to run in that, although I know people do. People live here, there are running clubs, life has to go on. 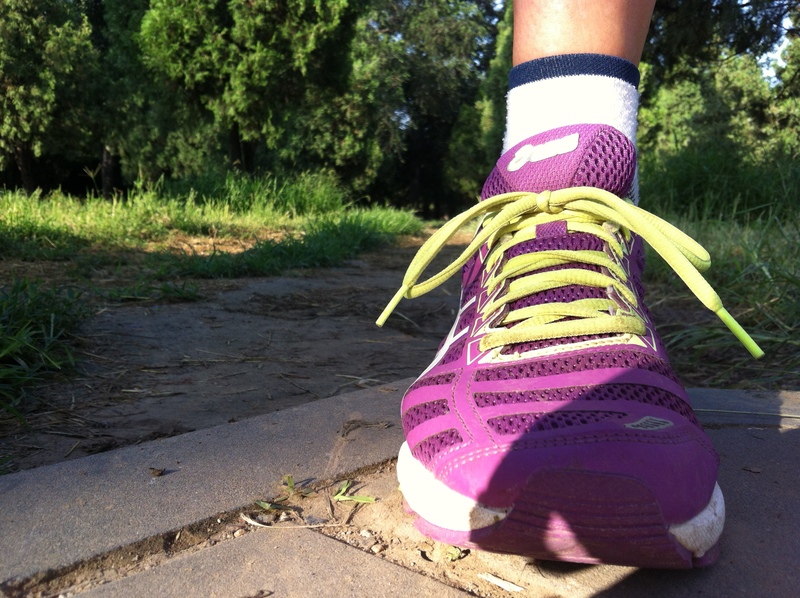 But I also know that runners here have apps on their smartphones to check pollution levels. If the levels are too bad I know some runners don’t run. Some runners wear masks. So, it is a problem. But I’m only here for a few days so maybe less of a problem and more just something to bear in mind. 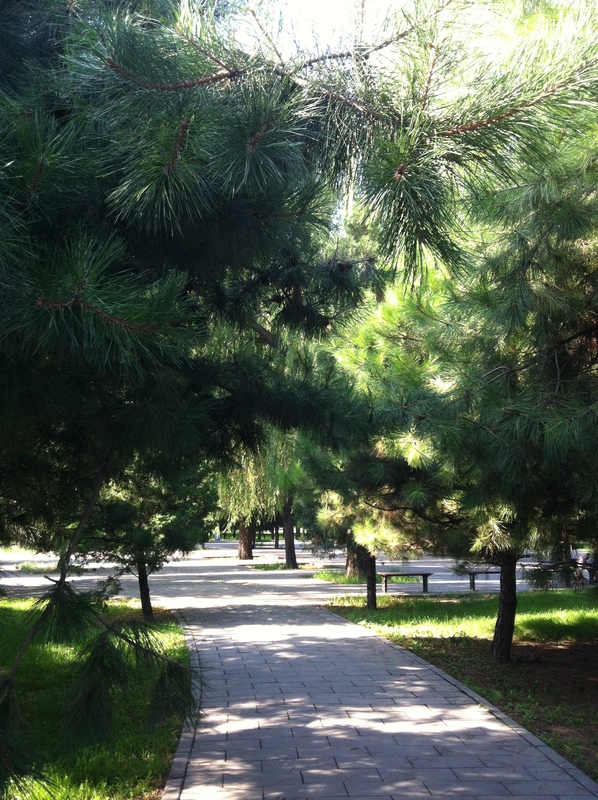 I’ve done a lot of walking, including spending an afternoon at the Temple of Heaven Park. It’s a huge, huge park in the middle of Beijing, probably the biggest and most popular. It’s got lots of walkways, trees, grass, toilets (handy to know after my last run) <link to last runs around the world> and, here’s a great thing, it’s FLAT. Oh, and there are also OTHER JOGGERS HERE. This is Wonderful. I can run here. I will no longer be looked at like a strange phenonemon. I will fit in. Ok, only fit in as much as I can, westerners still stand out here. But still, I will be able to run and feel much more comfortable. Again, this excited me like a kid at Christmas. Now, it’s really hot here. And quite humid, although still feels a million times better than Delhi. Must be a different kind of heat. I’ve already accepted I’ll be a red-faced sweaty traveller trying to escape to air conditioned places for most of my trip, but when it comes to running I’m not great in the heat. I find it really hard work. My favourite running conditions are slightly cool, maybe with a bit of drizzle. So, it seems it’s early morning runs again, only this time it’s to beat the heat. This is my first run where I’ve 1) had to get a metro to get to it and 2) paid to run (apart from a race). I’m used to just chucking on my gear, stepping out the door and going, so it was a bit different. But, alarm set, trainers on, metro navigated (without a map, no pockets) I arrived at the park at around 7am. I was surprised to see that it was actually just as busy as when I had been the previous day in the afternoon! 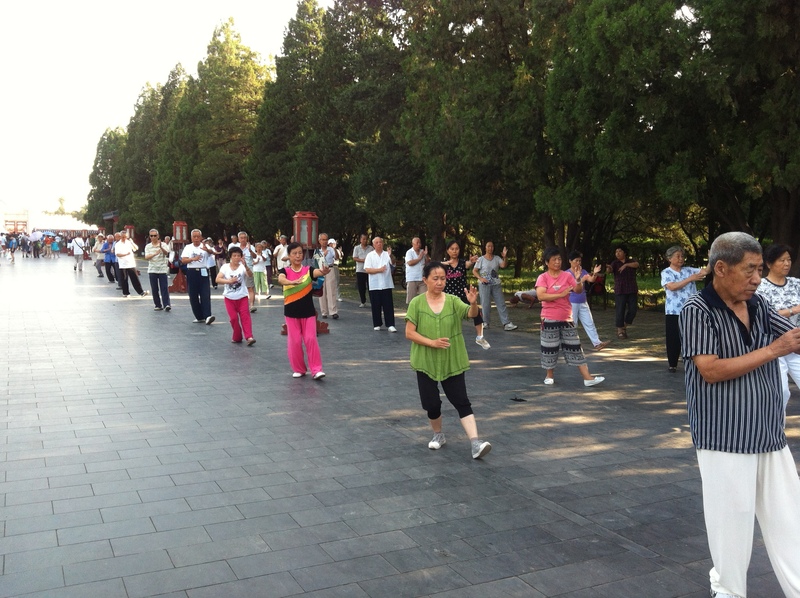 But, this time it was filled with loads and loads of older Chinese folk there for their morning exercise. It was great to see, because there was all kinds of different things going on, all around the park. Tai chi, jogging, dancing, keep fit, badminton, tennis, stretching, walking (forwards and backwards). You name it they were doing it. I even saw a man walking in circles round a tree, and a woman polishing a tree stump (not sure this was exercise though). How nice to think for that morning I was a Part of It. My run was ace. Yep, still slow (although not too bad, given that the temperature was already in the 30’s that early in the morning) but it was a lovely, long plod of 7 miles. My longest run in over 2 months, it was truly heaven. My legs felt the last mile again, but I have done a lot of walking over the last few days so I’m not surprised. It was nice to know the legs have still got it and I’m not back to 2 mile run fitness! AND I went for a 2.5 mile post-run walk to ease the legs off. And it felt great. And no aching the next day! I am liking Beijing, I am liking being active. Now, if it could just cool down a little bit please that would be nice. I know I went travelling to get a bit of sun but this isn’t quite what I meant…. 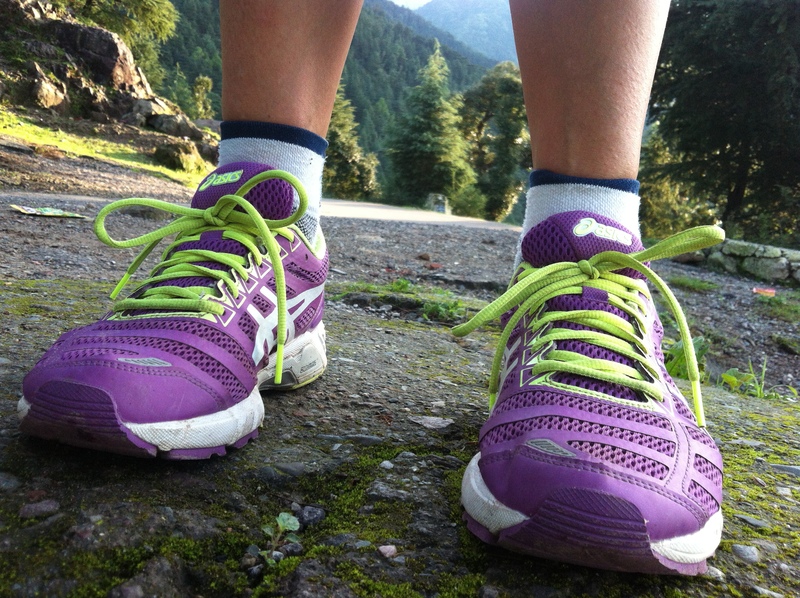 My last run in India was in Mcleodganj (pronounced mac-cloud-gange), the place I was in before heading back to Delhi. My favourite place so far; it’s a small place in Northern India where the government of Tibet, led by the Dalai Lama, is in exile. A friendly place, the town is centered around two bustling main streets where indians, tibetans, travellers from all around the world, buddhist monks and nuns in maroon robes, cows, dogs and cats all mix delightfully together. 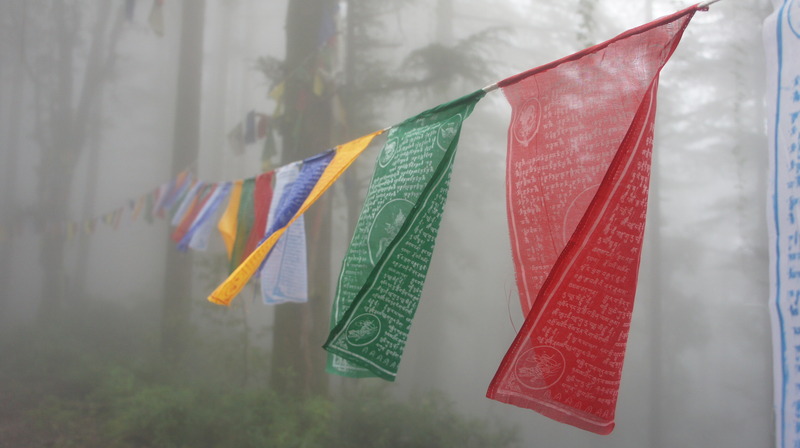 Although in India, there’s a heavy Tibetan influence with an abundance of prayer flags, maroon robes, temples and stupas both in and around the town, as well as the main streets being packed with tibetan restaurants serving the best momos (dumplings) around. This was my favourite run here so far. OK, granted, it was mainly because when walking the day before I found a flat route. Well, I say flat, there were still some slight gradients as it’s up in the mountains, but, compared to the other runs I did in India it was as flat as a pancake. And oh, how a flat route made such a nice change. It’s what I’m used to. Lincolnshire is flat. I was nearly bursting with excitement to go running as soon as I found that route, I couldn’t wait until the next morning when I would go. I felt like a kid at Christmas. I wonder if I have a running problem? Anyway, so, flat also meant I could run a bit longer, as it wasn’t so tough on my legs and lungs. So, I set of with the view of just running as much as I could, no set plan, time or distance. It was a there-and-back route. Not strictly my favourite, and I know some people hate that (Steve :P) but at least I’m not going to get lost. So, I just ran there and back and there and back again, as much as I could until my legs didn’t want to go any more. Because, I’m losing fitness. I’m losing the ability to think (and choose) “I’ll go for a ten mile run today” as I don’t know whether I can. I’m having to fit runs in as and when time, location and conditions allow, and can’t be too choosy. I don’t know whether I can run 10 miles any more; probably not, I haven’t done it for 2 months now. So I was chuffed to run 5 miles. It was nice to know I still could do a (kind of) long run. Well, longer than 3 miles anyway. I was happy with that. Like I said, I can’t be too choosy so I’ve got to take them where I can. It was an mixed run. It was great to get out there, and the scenery was just amazing again. In early morning sunshine I ran down the road out of town, the forest covered mountains on both sides of me, sometimes passing monks on their morning walks. I could see the Dalai Lama’s house and the town in the distance, perched on top of one of the mountains like a toy town the further away I got. It was hot though, and I was slow. I’ve slowed down, I can see by my times, which I guess is probably only natural given that I’m running a lot less and shorter distances. But it frustrates me. I know I can, enjoy, and used to run faster, dammit. Halfway in I needed the toilet. Running does this sometimes. Runners will know what I mean. I couldn’t wait, it was giving me a stomach ache and I wasn’t about to abandon the first flat run I’d had in a month. So, I had no choice but to go in the woods. Luckily there are lots of big rocks and leaves. And not many people around. What is it they say? All part of the experience. Not one I’d be wanting to repeat if I can help it though. My legs sure felt the last mile, and it was an effort to keep going as long as I did, but my stubbornness and need for rounded numbers meant I wanted to hit that 5 mile mark as a minimum. And I did, and bloody hell did it feel GOOD. In fact, not just good but Amazing. Fantastic. Euphoric. Brilliant. You get the idea. In fact, just writing about it is making me smile. You see, there’s no such thing as a Bad Run. Because, even if the run itself is hell on earth, that feeling you get when you finish outweighs it every time. Especially if it’s been tough. Those little endorphins being released are like little drops of magic. I’m in China now for a month, and WordPress seems to be a site that’s out of bounds. I’m managing to do a quick post via a VPN but won’t be able to do much more than that I suspect. So, I’ll be out of range for a while. Hey, it might do me good! So enjoy the break as I imagine there will be a flurry of activity and numerous posts when I can get back online! I’ve been a bit slack at blogging lately, I’ve been a bit too busy. 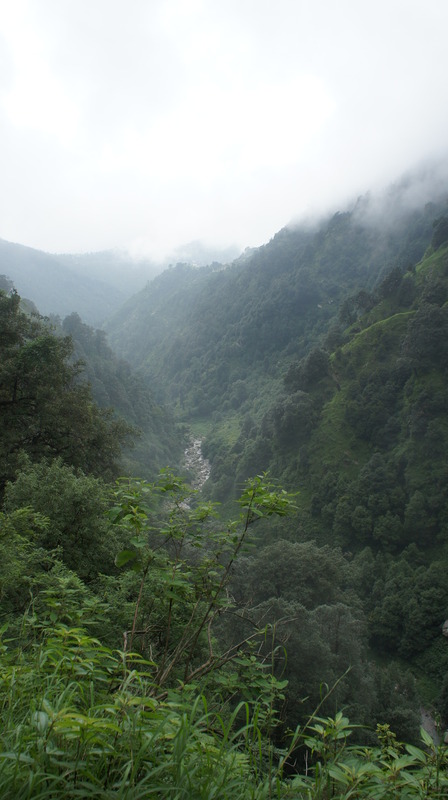 I’ve not written about Mcleodganj yet, my favourite place in India so far, or even Manali where I spent a week. So, with a day in Delhi to be spent in my nice air conditioned hotel room I’ll try and do a brief catch up. 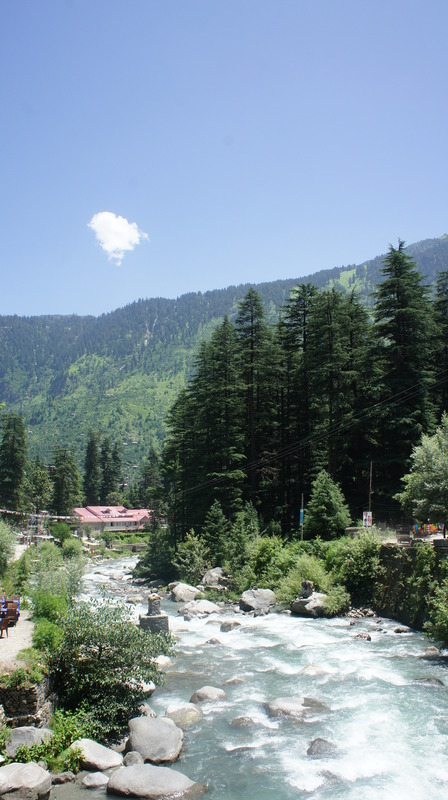 Manali was beautiful, all green forest-covered mountains with turquoise rivers. It felt a bit like an alpine scene (although I’ve never been to the Alps, so no idea whether this is right or not) and there was a very hippy vibe going on. Not that I’m in any way hippy but it was very relaxed. I ended up staying there a week, and in a way it was a bit like a holiday. I didn’t do much apart from eat, sleep, read, went on a few walks, a couple of runs and just generally chilled out. I didn’t really speak to that many people because I was feeling a bit anti social and in need of a bit of down time after a hectic few weeks (Donna, I nearly wrote quiet time but that’s not what I would have meant ;)). Wow it seems so long ago now, and I’ve realised there’s not a lot to write about. There might have been at the time, but not so much now. I ate a lot of porridge and Mars Bars, and read a lot of books. 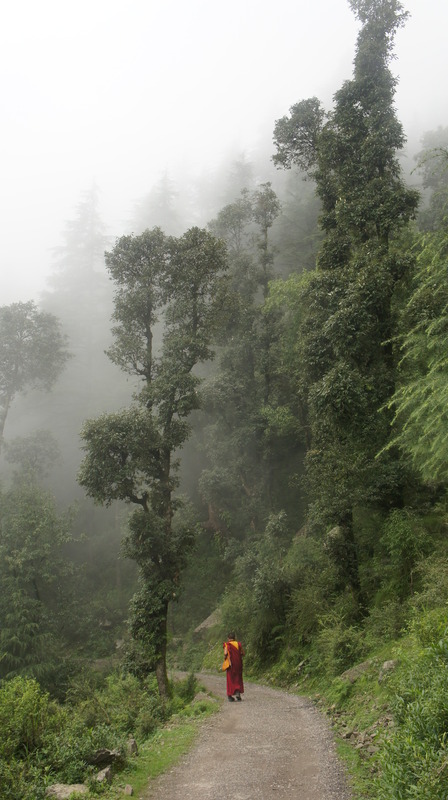 Mcleodganj was my favourite place in India. I stayed here for about 5 days after the Introduction to Buddhism course. I’m not sure why it was my favourite place, it’s very similar to Manali in some ways, but it had a different vibe. I loved the Tibetan feel of the place (it’s home to the Dalai Lama and many Tibetan people, monks and nuns), and it’s not quite so hippy. It was a place of many fabulous places to eat and chill out – I used to go to Cafe Budan every morning for banana honey porridge and to use the wifi. They also made the BEST lemon curd tart ever. I could have stayed much longer. I wonder if it was because I saw lots of people I ‘knew’ there (from the course) afterwards, so it was a little bit like being at home. Maybe it was because I made a great couple of friends there (Vicki and Anne) and we spent a fab few days together hiking and eating lots. Maybe it was because I found somewhere to stay only cost me about £1.28 a night which, although it wasn’t the most luxurious of places, was a great little sociable place with a hot shower and clean toilet, or the fact I found a flat running route at last. Or, the large amount of places to eat momos (a Tibetan speciality dish of dumplings). Or, it was a place where I did a lot of things, learnt a lot and felt a bit productive. Whatever it was, I loved it there and have many fond memories, and I was surprised at how sad I felt to leave. If I had longer in India, I probably would have stayed longer, and perhaps done some volunteering, as there are lots of opportunities to help out with different things. The only nice thing about leaving and coming back to Delhi is that everything didn’t feel damp any more. You see, it’s monsoon season in India, and it rained a fair bit in Mcleod. Most days, at some point, the heavens opened. Never for prolonged periods of time but when it rained, boy did it rain, and there was always a lot of damp in the air, so nothing felt dry. So, getting into bed, putting on clothes; all damp. I just got used to it after a while. Didn’t really have any other choice. And put it this way, I’d still rather be there and damp than in Delhi and hot and sticky. 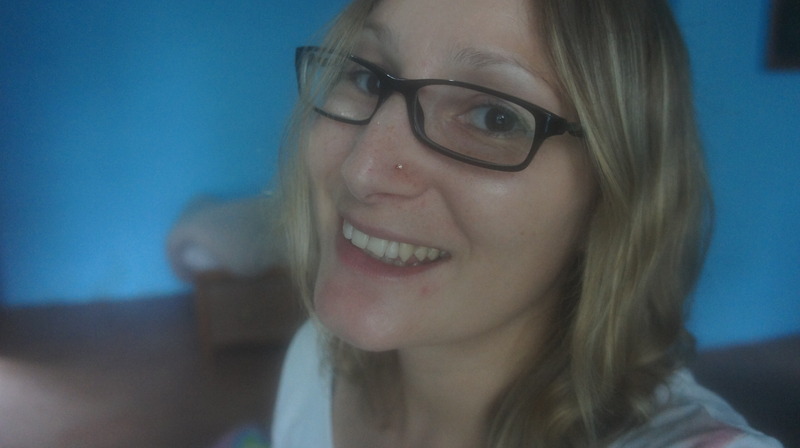 Oh, and I got my nose pierced here. Not sure why, just fancied it. I also bought an anklet and some baggy trousers. Maybe I am turning into a hippy after all, haha.